I’ve raced, competed in triathlons, done centuries, and regularly commute to work by bicycle. My law firm also sponsors a racing team. Attorney Fred Pritzker and his daughter, Sarah, biking together. Fred uses his experience as an avid cyclist to help people injured in bicycle accidents. Call 1-888-377-8900 for a free case evaluation. I have also been run off the road by careless drivers, knocked off my bicycle by suddenly opened car doors and almost killed by irresponsible left turning motorists. In short, and like you, I need to ride. It makes me feel good, it keeps me fit, and it’s good for the planet. But I also know that at any moment, I am vulnerable to serious injury or even death as a result of the negligence of the motoring public or the aggressive (and sometimes assaultive) behavior of certain drivers. I am also a personal injury attorney. I represent bicyclists injured by negligent motorists and defective bicycle components. In over thirty years of practice, I have represented thousands of clients and collected millions of dollars on their behalf. In short, I know how to ride and fix a bicycle as well as try a lawsuit on behalf of an injured bicyclist. There are good lawyers and there are experienced bicyclists, but there are few good lawyers who also happen to be experienced bicyclists. I represent clients throughout the United States. For a free consultation about your case, please call me toll-free at 1-888-377-8900 or use the form below to contact me at my law firm, Pritzker Hageman, P.A. Fred Pritzker is a former racer and commutes to work on his bike when weather permits. He even has a designated “parking space” just outside his office door. He speaks at legal seminars about TBI and other personal injury issues. The firm has a national reputation and its attorneys have been interviewed and quoted by The New York Times, The Wall Street Journal, USA Today, Lawyers USA, and other top news publications. Spinal cord injuries/ fractures often involve a cervical fracture (broken neck). A complete cervical fracture is referred to as a broken neck. This can be caused by the direct impact of the car or other vehicle or by the force of the fall. The extent of the paralysis associated with a broken neck depends on where the spinal cord was damaged. $3,500,000 on behalf of a child who suffered significant brain damage. $2,469,339 for the family of a woman who was killed when a right turning semi trailer ran over her while she was riding in the bike lane. $2,560,000 recovery for man who severely hurt his head when he was hit by a semi trailer truck. $1,225,666 on behalf of a woman who suffered brain injuries when hit by a farm sprayer that failed to stop at a rural intersection. $1,100,000 on behalf of a man whose was hit by a distracted driver during a left turn. Our client, who was hurled nearly 60 feet, wasn’t wearing a helmet and suffered a fractured temple bone, a severed nerve that caused him to lose hearing in one ear, and brain contusions. Attorney Eric Hageman, another lead attorney at our law firm, recently represented a woman who was riding along a parkway near the University of Minnesota when a car turned left in front of her. She collided with the back of the car and suffered bodily injury, including traumatic brain injury (TBI). Eric won the bicycle accident lawsuit at trial. The motorist driving the car maintained that his car was stopped at the time of the accident because he was waiting for a pedestrian. He also maintained that she may have been on the sidewalk as opposed to the roadway, and that she just rode her bicycle into his car. Piecing together partial witness accounts to best tell the whole story. Ulitimately, he was able to establish that the version of the accident told by the driver of the car was not true. Once the jury believed that, Eric and our team of bicycle accident lawyers won a very favorable result for our client. Unfortunately, many serious crashes involve inattentive car drivers. 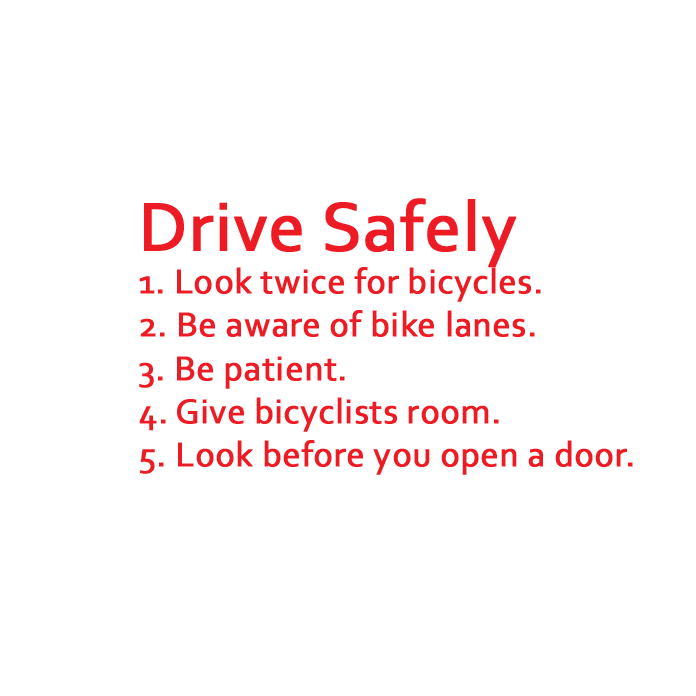 In most cases, the driver’s fault consists of failing to yield to the cyclist because the driver “didn’t see the bike,” opening a car door as a cyclist rides by (dooring), or running a stop sign. Distracted driver cases often involve a driver who is talking on a cell phone, eating, or engrossed in a conversation with a passenger. Beyond distraction, many of these cases involve drunk drivers. One of our clients has designed a bumper sticker in memory of his wife, who was killed by a semitrailer truck. We helped him get answers and justice with a bicycle accident wrongful death lawsuit. For information on obtaining a LOOK bumper sticker, please email Jon Jon Sandberg at [email protected].